Ultrasport F-Bike Review - Is worth the money? 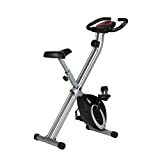 The Ultrasport F Bike is a compact, lightweight exercise bike with multiple levels of resistance and a portable design. Just three hours per week on this bike can help you improve circulation and improve strength. Let’s take a closer look and how well it performs. This bike is compact, easy to use and offers a great workout. The battery-powered LCD display allows you to monitor your heart rate, calories burned, speed, time and distance. You can even track your day-to-day progress. The LCD display is powered by battery, so there’s no need to fiddle with cords. With eight different resistance levels, you can choose a workout that’s right for your fitness level and experience. This is a bike that’s designed for people who want to stay fit, or people who are unfit and trying to get fit. If you’re already “ultra-fit,” even the highest resistance level is unlikely to give you an adequate workout. However, if you’re new to fitness, this bike will give you a good, challenging workout and help you see results. Although it’s not completely silent, this bike is exceptionally quiet. It won’t wake the neighbors or anyone else in the house if you use it at night. The heart rate sensors are located on the handlebars of the bike, so you can effortlessly monitor your heart rate the entire time you’re cycling. This is a great way to monitor just how effective your workouts are. We also liked that the pedals on this bike had straps to keep our feet in place. Strapless pedals – even with grips – are easy to slip off of, especially when pedaling at higher speeds. These straps fit snug around your feet, and keep them securely in place while you cycle. While the heart rate monitor, resistance level and quietness of the bike are all great features, its compact design is really what makes this a great piece of exercise equipment. The folding mechanism allows you to fold away your bike for easy storage and to save space. If you have a small home or flat, this is a great option. Even if you have a dedicated exercise room, the folding design of this bike will help you save space. Assembling the bike is breeze, and the entire process can be done in just six steps. The frame comes pre-assembled, so the only thing you need to do is attach the pedals, seat and handlebars. Altogether, assembly takes less than 30 minutes. Once the bike is setup, all that’s left to do is add batteries to the LCD display and start riding. If you’re 5’5”, you may find that this bike is too high for you. Although the seat is adjustable, the lowest setting may still be too high for some users. The seat’s height ranges from a minimum of 83cm to a maximum of 93cm. While it may not provide a challenging workout for advanced users, it can help you maintain your current fitness level. For those who are new to the world of fitness, this bike will provide you with an effective workout that will help you see results.